Leisure and Pleasure are often used interchangeably and are synonyms, but do have some differences. In this Grammar.com article, we discuss about these two words and how each is used in different contexts. · Make good use of your leisure time. · This work is not urgent, you can do it at leisure. Leisure activities – These are activities done in free time. That means use of the free time for entertainment or something that you have been wanting to do for long. · What do you do in your leisure time? · I had some leisure time before the meeting, so went to the bowling alley. · I read books in my leisure time. · Once the conference is over, I can have my food at leisure. · Once you retire from work, you can enjoy a life of leisure. Pleasure is a noun that means something that gives you happiness. · It gives me immense pleasure to welcome Mr. Howard to this event today. · Eating chocolates gives me a lot of pleasure. · I find pleasure in talking to her. · It would be my pleasure to serve you today. Pleasure is a positive emotion unlike leisure, however while talking about entertainment or recreation, leisure and pleasure can be used interchangeably. · We went to wonder la for leisure/pleasure. · I haven’t got a chance to travel for leisure/pleasure. · It is important to have some leisure/pleasure time to keep yourselves healthy and happy. Why do people ask – travelling for pleasure and not travelling for leisure? In your leisure time, you might do activities that may not necessarily give you pleasure… which can be doing exercise (for weight loss), signing some files (monotonous work), watching TV (for the sake of it) or talking to someone on phone (may be a formality). You could be doing these things because ‘you have to’ and you have some ‘free time’. · I wasted all my leisure time talking to the TV repair guy who could not understand what the issue was. · In my leisure time, I went to grocery shop and bought vegetables for home. · She had to watch KIDS TV in her leisure time because her daughter wouldn’t let her do anything else. So, as we see, doing activities ‘for pleasure’ is different from doing activities ‘at leisure’. 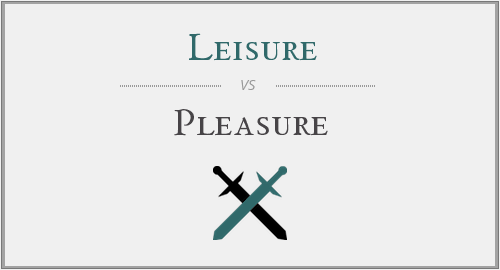 "Leisure vs. Pleasure." Grammar.com. STANDS4 LLC, 2019. Web. 22 Apr. 2019. <https://www.grammar.com/leisure_vs._pleasure>.